Featuring Peter Rowan and the Rowan Brothers, Balfa and Schwarz, Pete Sears with Jorma Kaukonen, the Georgia Sea Island Singers, the David Nelson Band, and the Flying Other Brothers. This episode explores the social folk roots of California rock music, with licensed rare and historical performances (hosted by Tony Bove of the Flying Other Brothers) — including whiskey songs, fiddle tunes, piano rags and primitive dance tunes. Featuring music by Paul Clayton, Kilby Snow, the David Nelson Band, the Flying Other Brothers, Ewan MacColl and Peggy Seeger, Sarah Hawkes, and Peter Rowan and the Rowan Brothers. This episode explores the ballad roots of California folk-rock music, with licensed rare and historical performances (hosted by Tony Bove of the Flying Other Brothers). From the European troubadours of the 16th Century to the early settlers of Appalachia, people have been singing songs about desperate men, senseless violence, murders and executions, damsels in distress, hard traveling, whiskey, gambling, and lost loves. Centuries have past, but we sing about the same things, and sometimes we sing the same songs. In this episode we explore the roots of several ballads that found there way into contemporary rock, and in particular into the repertoires of Jerry Garcia, David Grisman, David Nelson, and Peter Rowan. Ballads are most often folk poetry in a musical format, passed along orally from generation to generation, set to conventional tunes and usually sung by a solo voice. 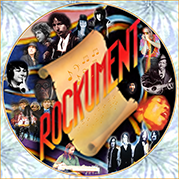 This episode explores the roots of rock music and the influences on rock performers, with licensed rare and historical performances (hosted by Tony Bove of the Flying Other Brothers). Many of the songs that inspire today’s rock, folk-rock, and bluegrass bands from California are rooted in what is called Americana: the country blues of the southern states, the cowboy songs of the western states, and that high lonesome sound of bluegrass and country ballads from Appalachia.